Executive Chef Luke Venner of elm in New Canaan teams up with EC Tyler Anderson of Millwright’s for a one-of-a-kind pop-up dinner experience! Pic courtesy of elm. Earlier in the week, NewCanaanite.com wrote that Nick Martschenko, Executive Chef and owner of South End, was proposing renovations and a new restaurant in place of Picador in New Canaan. 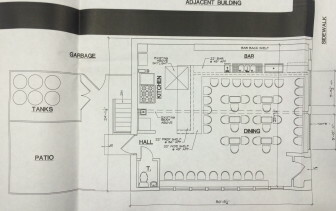 They said that, according to building plans submitted to New Canaan, the restaurant would be called South End Uncorked. We contacted Chef Martschenko regarding this and he told us that everything is still in the preliminary stages, even the name. “I am still developing the concept and decor,” he shared. “Actually, the deal is still not 100%.” He is referring to negotations with the owners of Picador, who currently own the space. This spot in New Canaan has a history of great restaurants like the always-evolving Picador and, of course, the wonderful and much-missed Harvest Supper where we spent many a night eating and drinking. Update: Locali will be open for business staring at 5 pm on 11/29. Take one Chopped competitor who is Executive Chef at Village Social Kitchen + Bar in Mt. Kisco, NY, add in a brand new New Canaan restaurant, throw in a handcrafted Neapolitan wood-burning pizza oven, and sprinkle in dashes of Mediterranean dishes and you’ve got the recipe for success. We are referring to Locali, located at 32 Forest Street (where Kouzina used to be), which will be opening up soon. After the closing of Pine Social in New Canaan, we were skeptical if another restaurant coming into that spot would also be successful. When we saw the menu and got information from South End, though, we began to change our minds. What finally made us change our minds is actually eating there. The food was fresh, locally sourced, and the menu was very fun and playful. For example, the tomato and mozzarella salad was one of the most unique interpretations that we’ve ever tasted with basil gelato and a tomato gelee. While some people have complained about the menu being confusing, that’s actually one of the things that we liked most about it…it’s like an adventure.